Jawa Forty Two is another Jawa Motorcycle with the 300cc engine. 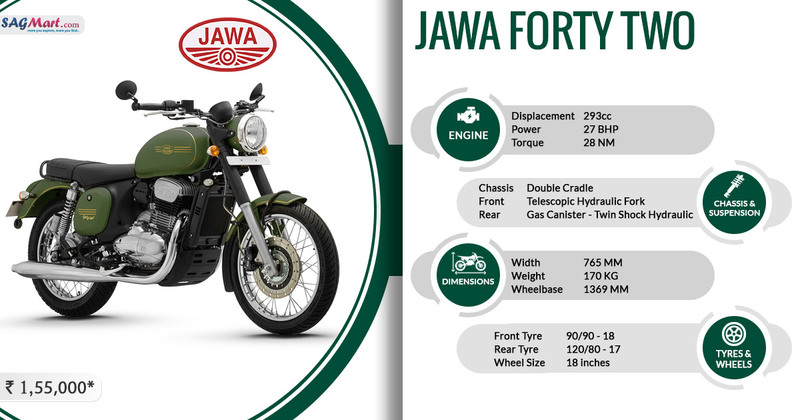 The motorcycle which has a sporty flair over Jawa’s classic design is the major attraction of the cruiser. For this motorcycle, the asking is INR 1.55 lakh (ex-Delhi) in which it offers motorcycle with components including blacked out front forks, an off-set instrument console and a round shaped halogen-lit headlamp that stands bike apart from the Classic 300 model.